As you might recall, in 2016, I was subpoenaed and deposed as a witness in the matter of Peggy Crisp v. City of Long Beach. Ms. Crisp had fallen on a broken sidewalk and had informed the City that my Council office had conducted inspections of her neighborhood sidewalks and gave information concerning the condition of the sidewalks to the Director of Public Works. Ms. Crisp was correct and inspection cards and an excel report were generated and sent to the Director of Public Works for a monthly meeting to discuss infrastructure repairs. During my sworn deposition I was informed by the Deputy City Attorney representing the City, that the City did not have any of the records to which I referred to in my testimony, despite the fact that my office staff had filed and indexed these records and that at a minimum City code requires those records be retained for at least four years. Your Deputy informed me and Plaintiff's attorney, that Councilwoman Stacy Mungo and Public Works Mike Conway had responded to requests for documents stating that none of my records had been retained by the City. 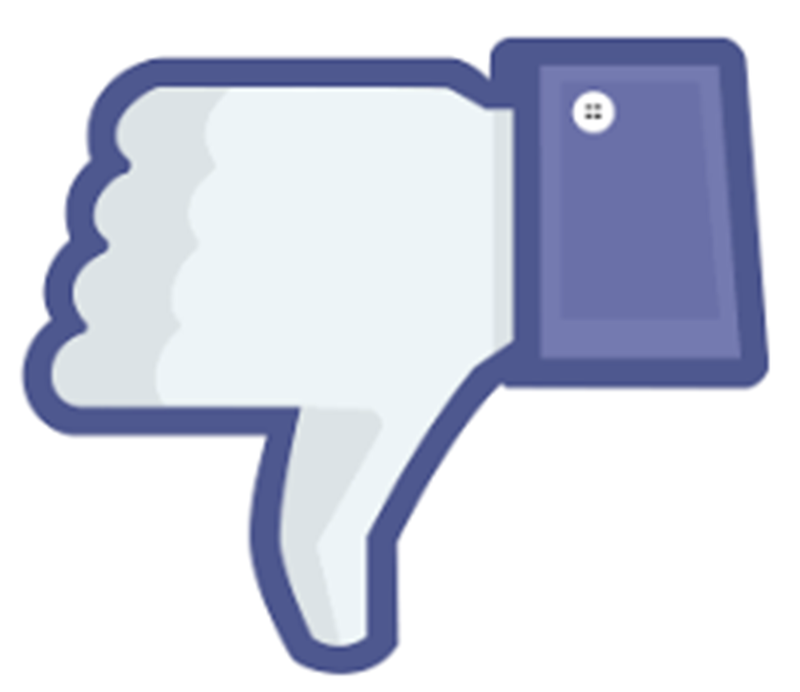 Shortly after the deposition, I was told that my office emails had been deleted 30 days after I left office. I did not appreciate the assertion by your staff that I was not telling the truth that these files were kept by my office and left there when I exited office. Imagine my surprise when I was informed that on Tuesday, January 8, the City Clerk has placed several items on the Consent Agenda requesting the Council authorization to destroy records of among other departments, the 5th Council District. The index of those records indicate that there are many boxes of files going back to 2006 when I took office. Either the Councilwoman and the former Director of Public Works purposely misled your office or your office misled during the deposition. I hereby request that the Council item be withdrawn and that the City Clerk disclose the content of each specific document in those boxes. In response to an email from community activist, Ann Cantrell, about the City Attorney's "impartial analysis" of Measure BBB -- which would extend term limits for the Mayor and City Council from two to three, I did some digging into the Government Code and Attorney General opinions about this issue. What I found is shocking! Government Code section 36502(b) requires that any term limits provision may only apply to terms served after the effective date of the measure. 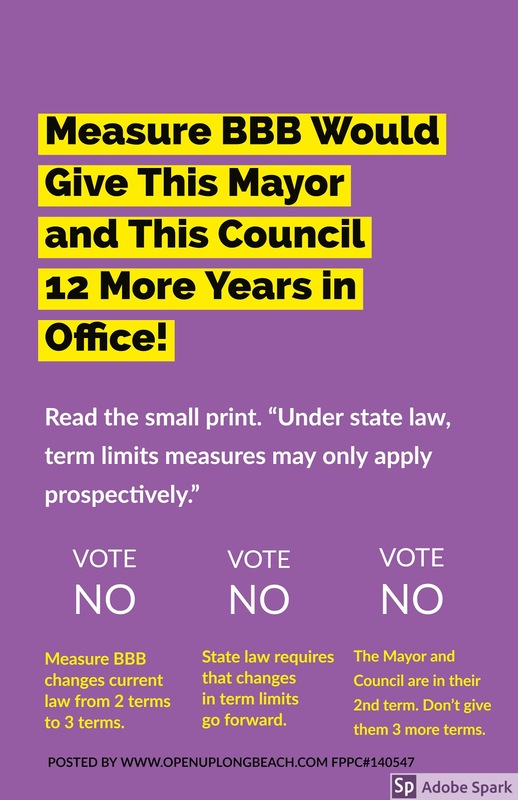 This means that should Measure BBB pass, this current Mayor and City Council will be allowed to seek 12 more years in office. No wonder they are pushing so hard for its passage! 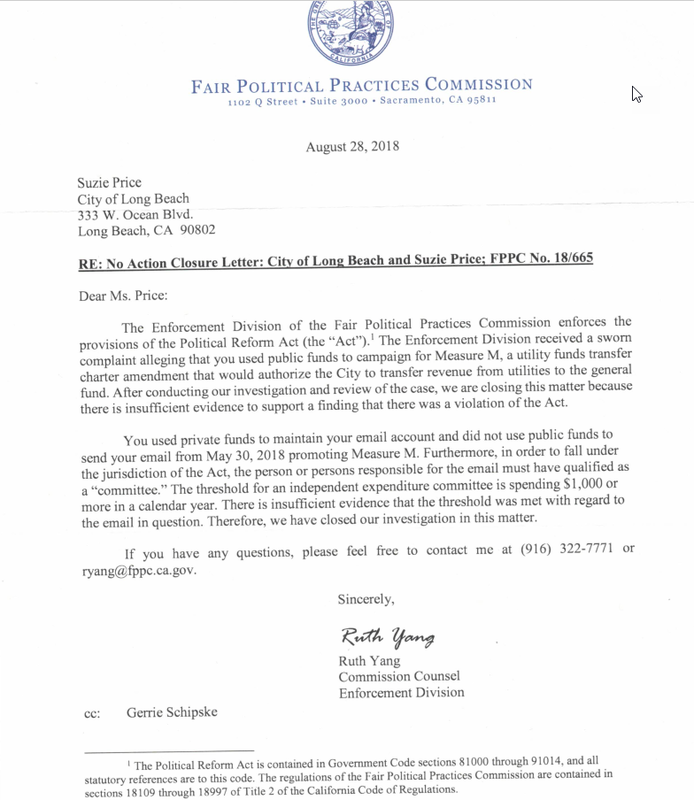 Long Beach, CA – September 14, 2018 – Ruth Yang, Counsel for the Fair Political Practices Commission today told Gerrie Schipske, who filed complaints with the FPPC, alleging that the Mayor and City Council had spent taxpayers’ dollars to advocate for passage of Measure M, that she did not find “enough evidence” to continue an investigation. Schipske had alleged that the Mayor and City Council collectively and individually had spent taxpayer dollars to advocate for the passage of Measure M. Specifically, the City hired a political consultant to develop direct mail pieces that were not sent to all voters, but a targeted 43%, which makes them not general information as required by law. Additionally, the pieces advocated for passage by omitting key issues such as the measure was a tax; the transfers were from gross revenues and the City could raise utility rates to pay for the transfers. 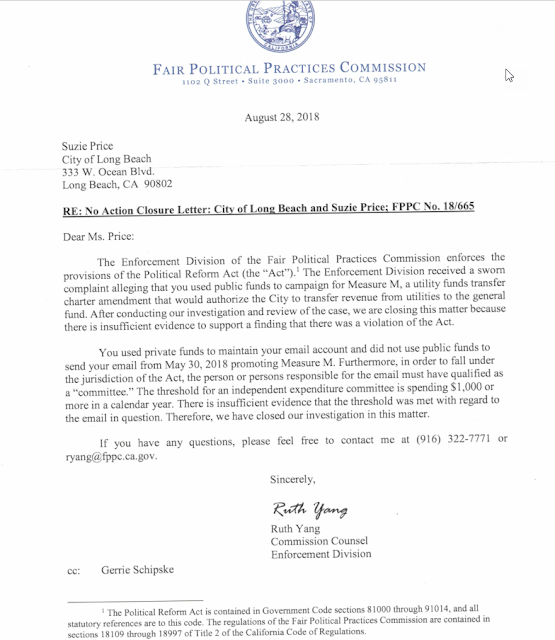 Schipske added that Ms. Yang apologized for not having sent correspondence earlier on the entire complaint, and instead only responded to allegations concerning Mayor Garcia and Councilmembers Richardson, Andrews and Price utilizing taxpayer paid cellphones and emails to advocate for the passage of Measure M.
The Fair Political Practices Commission (FPPC) which investigates complaints about certain violations about campaign spending and spending of taxpayer money to advocate for or against ballot measures or candidates, has dropped its investigation against Third District Councilwoman Suzie Price. 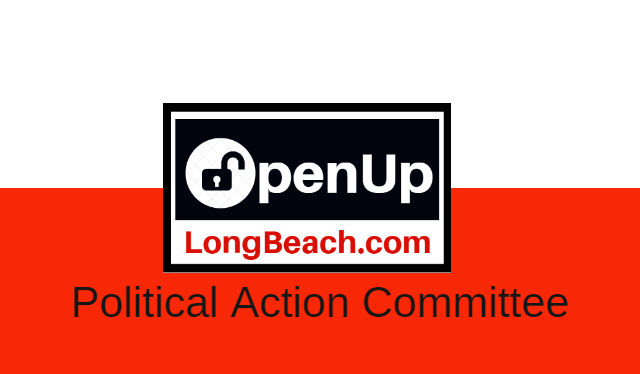 A FPPC complaint had been filed by OpenUpLongBeach founder and public advocate, Gerrie Schipske, asserting that the Mayor and City Council and certain individual councilmembers used taxpayer monies to advocate for the passage of Measure M.
In dismissing the complaint that Councilwoman Price had used taxpayer funds to send out a lengthy email advocating for Measure M, the FPPC Enforcement Division held that Councilwoman Price used "personal funds" to advocate for Measure M and that because the threshold for an independent expenditure is $1000 or more, the complaint was dismissed. 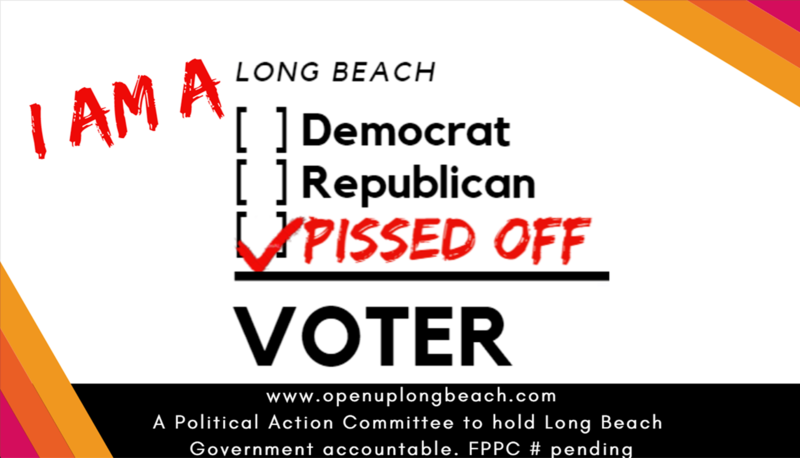 The complaint against the entire City Council and Mayor concerning hiring a political consultant to target only a portion of voters with information and advocacy on Measure M is still under investigation by the FPPC. 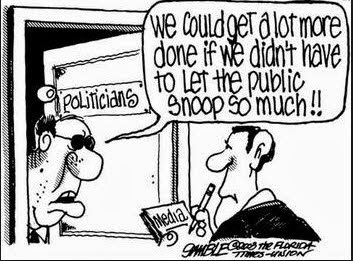 Monetary contributions to political campaigns are a legitimate form of participation in the political process, but the financial strength of certain individuals or organizations should not permit the exercise of a disproportionate or controlling influence on the election of candidates…The integrity of the governmental process, the competitiveness of campaigns and public confidence in local officials are all diminishing. 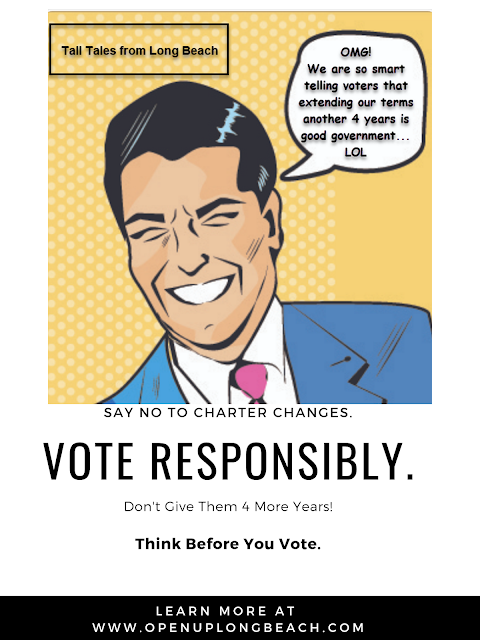 Today, many voters are concerned about how the ‘Campaign reform Act’ has been weakened by this Mayor and this City Council and how we are seeing the growing power of special interests in our City which contribute tens of thousands of dollars for candidates and ballot measures. 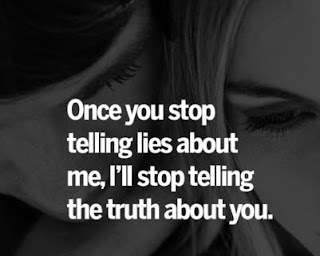 Consequently, this Mayor and this City Council continue to raise taxes, to increase and consolidate their power and to further weaken the City’s ‘Campaign Reform Act’. Voters supporting open, transparent and accessible local government need a way to reach other voters to stop these actions. A political action committee will provide this way by raising and spending money to reach voters with the information they need to make good decisions at the ballot box. OpenUpLongBeach.com/Political Action will be a general purpose, local political action committee. Our Treasurer will be David Gould, a seasoned political consultant on campaign finance. 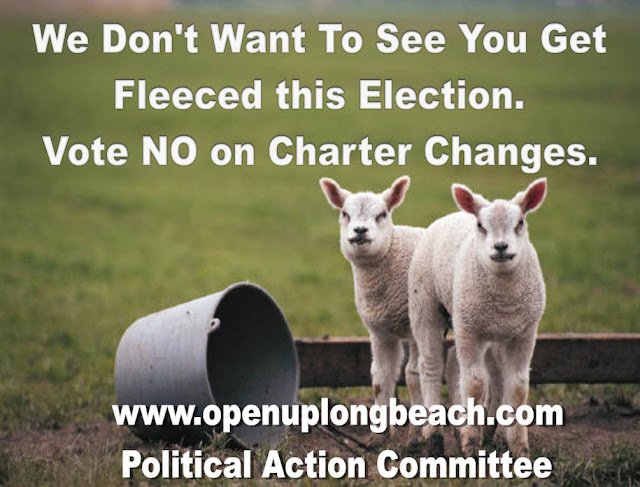 Contact: Gerrie Schipske: 562 201-1296 and openuplongbeach@gmail.com.